Above: The lighthouse at the entrance to Agrostoli harbor. 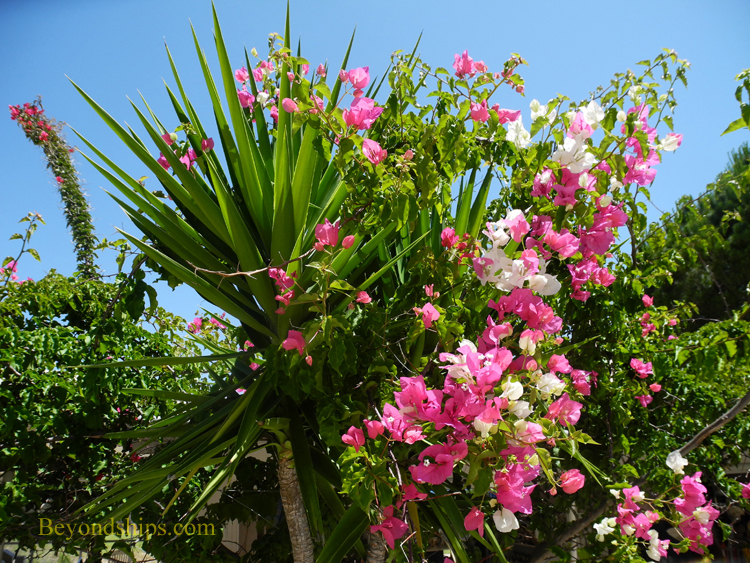 Above: Impressive floral displays are not uncommon in the towns and villages. Below: The countryside is often mountainous and dry in the summer. Above: The remains of an ancient Roman theater in Fiskardo. 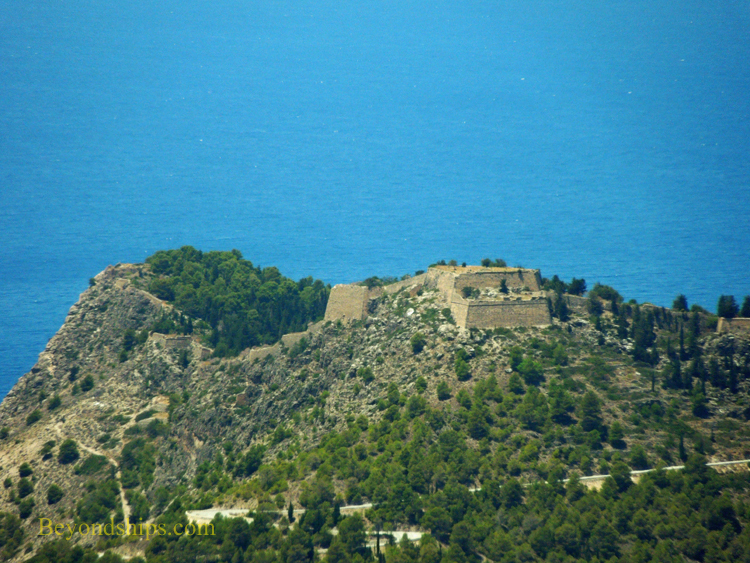 Below: The Ventian Castle of Asso. Although the 1953 earthquake destroyed most of the island's existing buildings, there are still some traditional houses. Above: The cruise ship pier at Agrostoli. 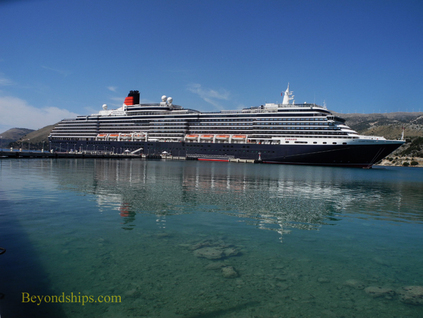 Below: Cunard's Queen Victoria during a call in Agrostoli. Above: Sea turtles are not an uncommon sight swimming around the cruise ship pier. Below: Looking across the bay at Agrostoli. The Drapano bridge is in the foreground. Cephalonia, also known as Kefalonia is a destination that captures the imagination. Relatively undeveloped as a tourist destination and sparsely populated, it is still possible to imagine the ancient Greek heroes who legend says strode this island. At the same time, you can enjoy its natural beauty and environs that seem to just call for you to relax. 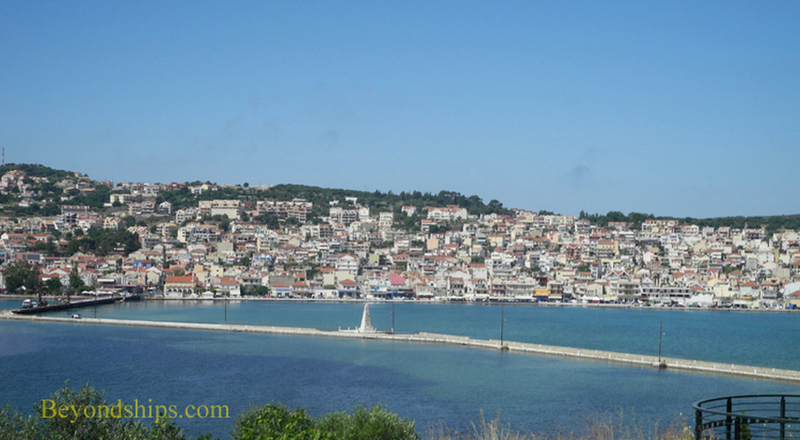 The largest of the seven Greek islands in the Ionian Sea, Cephalonia is quite mountainous. Its highest peak, Mount Ainos, rises to 5,341 feet (1,628 meters). Adding to the scenic beauty are the many small inlets and bays along the coast. 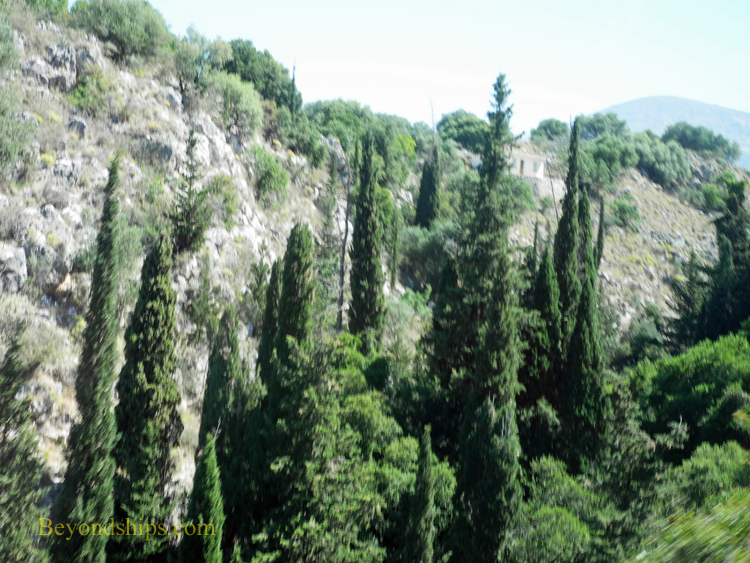 Cephalonia has a mild climate - - it is dry and hot with plenty of sunshine in the summer while the winters are rainy with a touch of snow in the mountains. Evidence indicates that people have lived on Cephalonia since at least 50,000 B.C. Because of its location on ancient trade routes, the island grew rich from trade. In addition, its now balding mountains were essentially deforestated over the years in order to build ships. However, these connections to the outside world also resulted in Cephalonia becoming involved in numerous ancient wars including the Trojan War, the Persian Wars and the Peloponnesian War. In 188 B.C., the Cephalonia was invaded by the Romans, looting the island and selling the inhabitants into slavery. However, the island eventually became a Roman province. Important Roman antiquities showing a luxurious lifestyle are still being discovered. The Middle Ages were a turbulent time for Cephalonia. At first, the island was under the control of the Byzantine Empire followed by the Normans, the Kingdom of Naples and still later the Ottoman Turks. However, in 1500, the Ottomans were driven out by the Venetian Republic. Cephalonia remained under Venetian control until 1797. In that year, Napoleon Bonaparte conquered Venice and took her Ionian colonies for France. Two years later, the Ottoman Turks, supported by Russia ousted the French but when Czar Alexander I made peace with Napoleon in 1807, the island reverted back to France. This turn of events did not bring peace. Instead, Napoleon's most steadfast enemy, Great Britain, attacked and drove out the French. In the treaties following Napoleon's abdication in 1814, the Ionian islands became a British protectorate. During this period, the poet Lord Byron visited Cephalonia on his way to assist the cause of Greek freedom from Turkish rule. In 1864, Cephalonia, together with the other Ionian islands, was united with the recently independent Kingdom of Greece. Early in World War II, the Axis powers, Italy and Germany, occupied Cephalonia. But after Italy concluded an armistice with the Allies in September 1943, fighting erupted between the Germans and the Italians. The Germans prevailed and executed 5,000 of the 9,000 Italian soldiers that took part in the revolt as a reprisal. One of the most talked about dates in the history of Cephalonia is 1953. In August of that year, a massive earthquake ravaged the island. Six hundred people were killed and many more injured. Entire towns were destroyed. 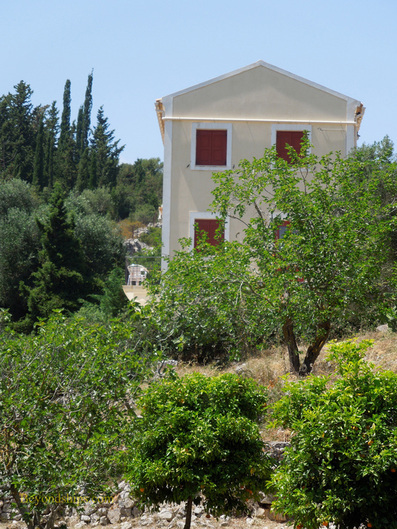 Prior to the quake, there were 365 villages in Cephalonia; now there are only 200. 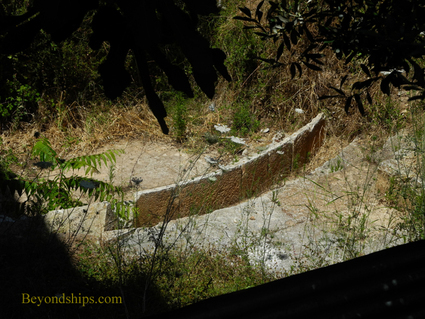 As a result, although Cephalonia has a long history, you will see very few structures that date from before 1953. 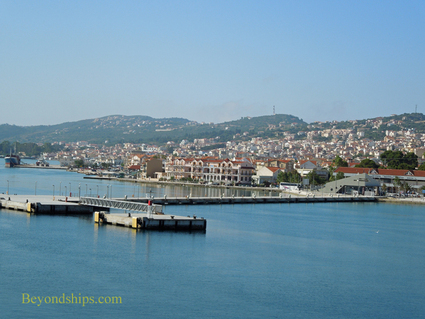 Cruise ships arriving in Cephalonia can dock at a new pier in the capital, Argostoli. 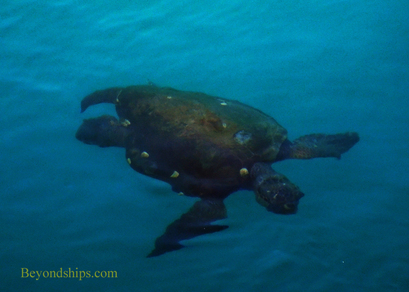 The waters surrounding the pier, as seemingly throughout Cephalonia, are quite clear and sea turtles are often seen frolicking around the pier. Agrostoli is more of a town than a city – – the population of the entire island is only 33,000 with about a third living in Agrostoli. The capital is somewhat sprawling but well-laid out with wide streets and squares. Almost the entire town had to be re-built after the 1953 earthquake. One exception is the Drapano bridge,which runs across the bay linking the peninsular that Agrostoli is on to the main part of the island. It is a stone structure built by the British in 1847 to replace a wooden bridge that they had erected in just 15 days in 1813. 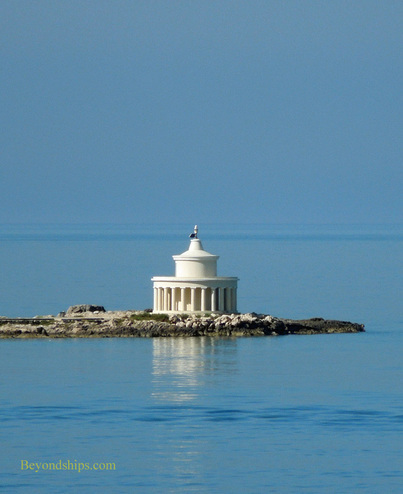 At the opposite end of that same peninsular is a lighthouse that looks like an ancient Greek temple. It too was originally built by the British but had to be re-built following the earthquake. Cruise ships arriving and departing Agrostoli pass close by it.